﻿ Listen to DRM Digital Radio Broadcasts. A 12 kHz Converter Circuit with 2 CB XTALs. Another circuit I made up was designed around two common CB Quartz crystal oscillators (Q1 and Q2) and a simple FET Mixer (Q3). 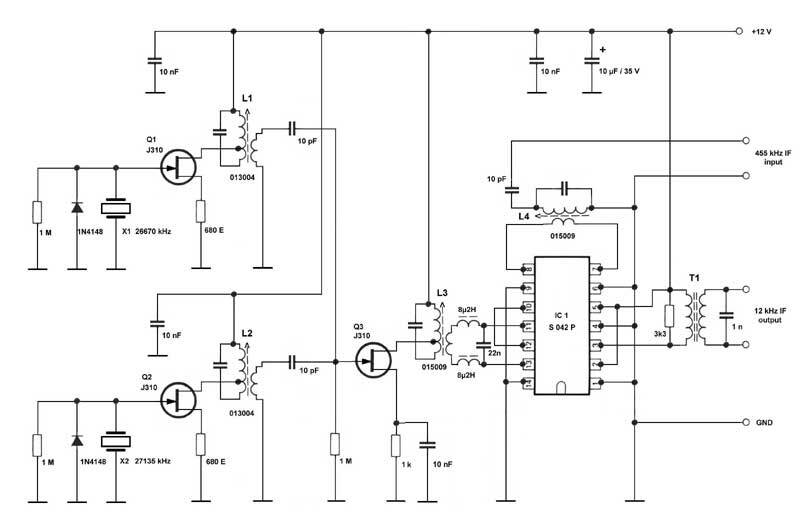 This circuit is very stable and works fine down to less than 8 Volts supply voltage. The 465 kHz output (nominal local oscillator frequency: 467 kHz) is generated from the heterodyne between two common CB crystals using one Receiver crystal and one Transmitter crystal. The output from the two oscillators are fed to Q3, which has a 455 kHz IF Transformer in its drain. The circuit . . . The 465 kHz output from Q3 is fed via a the IF Transformer tuned to the heterodyne frequency and fed to one of the the balanced mixer's (S 042 P) inputs, pins 11 and 13. The 455 kHz IF from the short wave receiver can be picked up at a low impedance point in the Yaesu FRG 7700. The IF voltage level at this point is about +90 dB µV. This IF signal is coupled via a small capacitor and fed to the balanced mixer via a 455 kHz IF Transformer, T4. The 10 kHz IF output is recovered on pin 2. The isolation between the receiver and the PC is provided by the interstage transformer found in an old CB transceiver. To further increase the bandwidth of the IF signal, a 3,3 kOhm resistor is soldered in parallel to the secondary winding of the transformer. A small ceramic capacitor is soldered to the secondary winding of the transformer to reduce noise. The S 042 P provides ample 10 kHz output to feed the Line Input of the computer's Sound Card. Be sure to mute the Line Input in the computer's Volume Control Panel, otherwise the 10 kHz signal will be heard as noise in the speakers. If you connect to the computer's Microphone Input, then it would be wise to add a 5 kOhm potentiometer to the secondary winding of the transformer to reduce the output level in order not to overload the microphone input. The 455 kHz IF from the short wave receiver can be picked up at a low impedance point in the Yaesu FRG 7700. The IF voltage level at this point is about +90 dB µV. This IF signal is coupled via a small capacitor and fed to the balanced mixer via a 455 kHz IF Transformer, L4.